The distance from the main bulkhead, 200mm, shall be understood as the fixing point. No part of a handhold shall come closer to the sheer line than 100 mm. The handholds are to be considered as safety equipment. It is allowed to cover the iron ballast keel with fiberglass, reinforced plastic, filler and paint, provided the finished dimensions are within the tolerances of the keel drawing. This is for rust protection an covering of the gap between iron ballast keel and hull. For information: NFIA is doing a survey regarding keel dimensions compared with existing drawing. This survey will continue 2016. NFIA is aware of that some keels are originally a little bit on the minus side. Please be aware of the bottom rounding profile. Special attention will be given to this at bigger sailing events, such as Gold Cup, 2016. It is not allowed to alter the profile more than the tolerances on the keel drawing, from which here you find a cut-out. In the recent past there has been some discussion about the handling of measurement proofs in sails. According to CR 9.16 each sail shall be measured and approved by an official measurer who shall stamp or fix an official sail button and sign and date a mainsail or headsail near the tack, and a spinnaker near the head, all acc. to rule CR 1.54. Sails manufactured in Germany or in Denmark for instance get by the licensed measurer the blue button of the country’s national sailing association; sails coming from the UK, Sweden or Austria are simply stamped and signed by the measurer in charge without a button fitted to the sails. Sails not being clearly to identify where or by whom they have been measured, could be subject of a re-measurement, for instance with championships or measurement protests. In these cases the measurer in charge may insist on tagging a measurement proof valid in his home country even when the sails are manufactured in foreign countries. The Technical Committee has clarified CR 11.11.2. 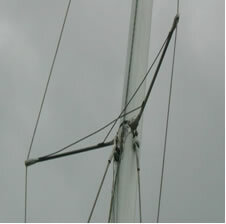 According to the rule a tie-rod between deck and mast-step is permitted. Also acceptable is a "stiffener" between those two points. Second-hand material for Nordic Folkboats (like boats, sails, trailer ...) are offered on several websites. For Germany you will find a market-place (Marktplatz)on www.folkeboote.de. For Finland please review www.folkkari.net. For other countrys please contact the local associations. Technical Committee have by request of a National Union evaluated a question about the legality of a Spreader Construction included 2 pcs. of crossmembers (see attached picture # 1). In case a certfied sailmaker is in need of the NFIA sail buttons, please contact the NFIA secretary via E-Mail ( secretary(at)folkboat.com ). After advice from the Swedish Folkboat association the Technical Committee is being aware that there are produced some masts in Denmark in Thuja-wood. According to this information we have investigated this, and the Danish mast builder have informed us that in total there are built 12 masts in Thuja-wood: 3 of those are broken, 1 is in Norway and the rest is probably mounted on boats in Denmark, Germany and/or Sweden. The mast shall only be made of European spruce, European pine/Oregon pine or Sitka spruce. Thuja-wood is a Cypress (Cypress occindentalis ) and growing in Canada. Using of Thuja-wood to masts for the Nordic Folkboat is not permitted. When measuring rudders at the Gold Cup in Malmo, Sweden it was found that there were variations in the thickness of several rudders. The Board of NFIA has at its meeting in March 2006 discussed the matter and it was decided that it was necessary to point out that the rudder on a Folkboat must look the same as rudders on all other Folkboats. As a consequence of certain sailors creativity, and the difficulty in the manufacturing process when constructing GRP rudders, the board proposed an amendment to the class rules to set the limit for rudder thickness to a max. of 50 mm. below the CWL (Construction Water Line). Is it permitted to sail in a race with a outboard engine mounted? The item would be an obstruction for other boats that are crossing the course and will further require other boats to give the boat with the engine undeserved room when rounding marks. Referring to rule 1.11 is it not allowed to race with a outboard engine mounted on the aft of the boat. Particularly circumstances may make it necessesary to have direct access to an engine. Therefore it is acceptable to have the permanent part mounted on the aft deck. It is not in accordance with the CR to race with an outboard engine mounted on the aft deck of the boat. All other equipment and items - including permanently fitted electronical or electrical accessories - shall be removed with weighing. The Board and Technical Committee have been requested to clarify the rule regarding Bucket or Bailer as per CR 11.10.7. The intention of the rule is that the crew shall be able, should there be a malfunction of the pump, to easily remove water entering the boat. The Bucket or Bailer is a circular or rectangular item with a robust bottom, vertically side or sides and an open top with an area not less than 380 cm2. (Equal with a diameter: Ø 220 mm.) and with a robust handle attached near the open top.